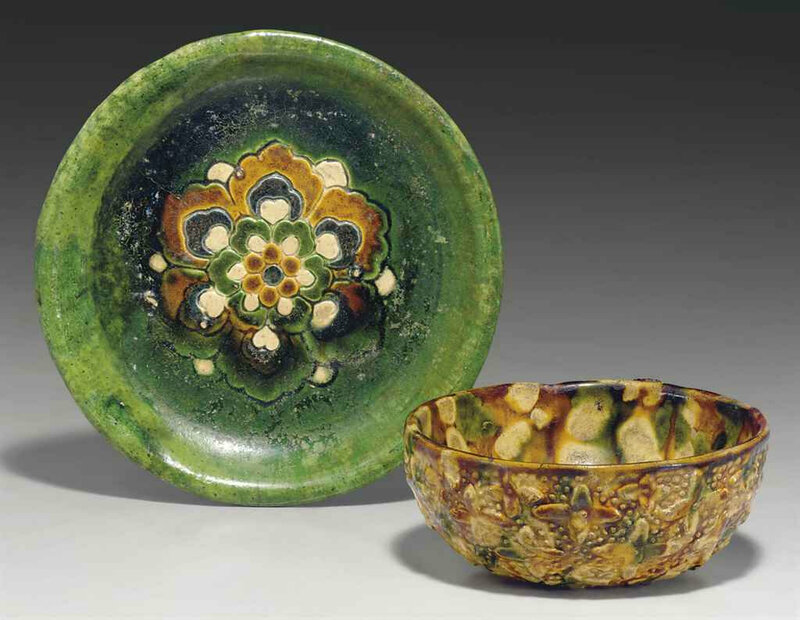 One a small shallow dish, impressed in the center with a flower head in amber, green and cream glaze reserved on a green glaze that continues over the rim to partially cover the flat base; the other a small bowl with deep rounded sides, molded on the exterior with a pattern of four-petaled flowers reserved on a granular ground, the base with a flower head, splash-glazed in green, amber and cream all over, wood stands. Provenance: Dish: Sotheby's, New York, 8 May 1980, lot 110. Bowl: The Honorable Hugh Scott Collection: Sotheby's, New York, 19 November 1982, lot 166. Greenwald Collection nos. 17 and 18, respectively. Literature: Dish: Gerald M. Greenwald, Two Thousand Years of Chinese Ceramics, 1996, no. 17. Bowl: H. Scott, The Golden Age of Chinese Art, Rutland, Vermont/Tokyo, 1966, pl. 61. 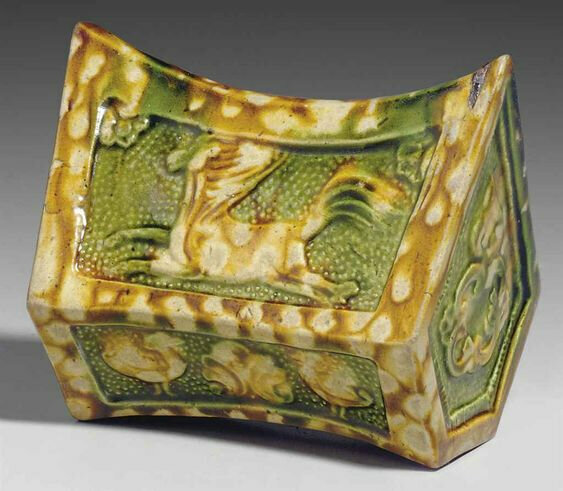 Gerald M. Greenwald, Two Thousand Years of Chinese Ceramics, 1996, no. 18. Exhibited: Chinese Art from the Collection of the Hon. Hugh Scott, Mary Washington College, 1968, no. 84.